An investors meeting isn't the most high-profile of venues to announce a game, but an inauspicious start doesn't make the new Kirby game look any less fun. 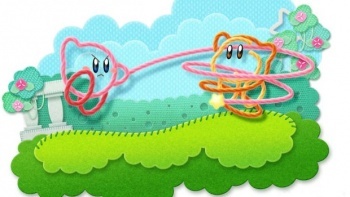 Kirby's comeback on home consoles isn't just limited to Epic Yarns, as Nintendo has revealed a new Kirby game for the Wii. The side-scrolling adventure is currently in development at Nintendo's HAL Laboratory and will be the second Kirby game to appear on the Wii. Nintendo revealed the game as part of an investors meeting to discuss its third quarter earnings. When the details of the meeting hit the company's website, Nintendo added a short - not to mention tiny - video of the game in action. In just 35 seconds Kirby dodges a trio of falling rock pillars, busts up enemies with an enormous cutlass, summons a dragon made of fire, and blasts foes with a miniature cannon. That's on top of his trademark move of inhaling assailants and turning them into star-shaped projectiles in his belly. The game doesn't have an official title or a release date yet, but the video makes it look like it's nearly finished. Hopefully, Nintendo will provide some concrete information about the game soon, and with any luck we won't have long to wait until it comes out. UPDATE: The video from the Nintendo website has made its way to YouTube. The quality has suffered a little after being made so much bigger than the original, but you can still see how much fun the game looks.